PBR - My recent story about Cole Hamels and his pursuit of the Cy Young Award ignited an e-mail exchange with a reader about Steve Bedrosian's 1987 campaign. 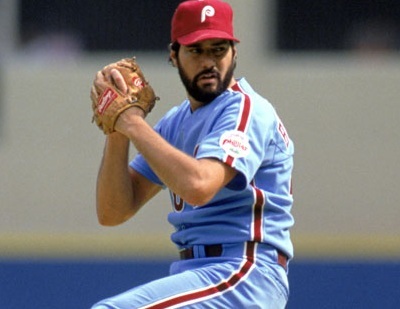 Bedrosian, for those that don't know, won the Cy Young Award in '87 as a closer with the Phillies. The club finished fourth with an 80-82 record but "Bedrock" notched 40 saves and trumped Rick Sutcliffe and Rick Reuschel for the award. He's also one of just four pitchers in Phillies history to win the award (Halladay, Carlton and Denny are the others). The reader wanted to see how Bedrosian's award-winning season compared to Brad Lidge and his 2008 season. For the record, Lidge finished fourth in Cy Young Award voting in '08. The simple chart below lists some common statistics comparing '87 Bedrosian and '08 Lidge. As you can see, Lidge has the advantage in eight of the ten categories and was more dominant than Bedrosian. Not included in the chart is opponents batting average against but Lidge holds that advantage too (.227 vs. Bedrosian | .198 vs. Lidge). Going a step further, let's look at how Bedrosian and Lidge performed in high-pressure situations. Fangraphs calculates various win probability metrics and one of them is titled 'clutch.' This metric measures how well players/pitchers perform in defined clutch situations relative to how they would have performed in a non-pressure situation. Bedrosian posted a 0.70 clutch rating while Lidge posted a 1.20 rating, meaning Lidge performed better than Bedrosian in high-stress situations. The entire formula is complicated so for the best explanation visit Fangraph's page All About Clutch. To put it simply, '08 Lidge > '87 Bedrosian.